incipient carbonation of peridotite. Chemical Geology, in press. (45) -Bonnemains D., Escartin E., Mével C., Andreani M., Verlaguet A., 2017. Pervasive silicification and hangingwall overplating along the 13°20'N oceanic detachment fault (Mid-Atlantic Ridge). Geochemistry, Geophysics, Geosystems, DOI10.1002/2017GC006846. (44) - Escartín, J., C. Mével, S. Petersen, D. Bonnemains, M. Cannat, Andreani M., N. Augustin, A. Bezos, V. Chavagnac, Y. Choi, M. Godard, K. Haaga, C. Hamelin, B. Ildefonse, J. Jamieson, B. John, T. Leleu, C. J. MacLeod, M. Massot-Campos, P. Nomikou, J. A. Olive, M. Paquet, C. Rommevaux, M. Rothenbeck, A. Steinfuhrer, M. Tominaga, L. Triebe, R. Campos, N. Gracias, and R. Garcia, 2017. Tectonic structure, evolution, and the nature of oceanic core complexes and their detachment fault zones (13°20’N and 13°30’N, Mid Atlantic Ridge), Geochemistry, Geophysics, Geosystems, doi 10.1002/2016GC006775. (43) - Debret B., Andreani M., Delacour A., Roumejon S., Trcera N., 2017. Assessing sulfur redox state and distribution in abyssal serpentinites using XANES spectroscopy. Earth & Planetary Science Letters, 466, 1-11. (42) - Pens M., Andreani M., Daniel I., Perrillat J-P., Cardon H., 2016. Contrasted effect of aluminum on the serpentinization rate of olivine and orthopyroxene under hydrothermal conditions. Chemical Geology, doi: 10.1016/j.chemgeo.2016.08.007. (41) - Escartin J. and the science party of the ODEMAR cruise, 2016. First direct observation of coseismic slip and seafloor rupture along a submarine normal fault and implications for fault slip history. Earth & Planetary Science Letters, 450, 96-107. (40) - Vilaseca, G., C. Deplus, J. Escartín, V. Ballu, P. Nomikou, C. Mével & Andreani M., 2016. Oceanographic signatures and pressure monitoring of seafloor vertical deformation in near-coastal, shallow-water areas: a case study from Santorini Caldera, Marine Geodesy, In press. (39) - Bonnemains D., Carlut J., Escartin E., Mével C., Andreani M., Debret B., 2016. Magnetic signatures of serpentinization at ophiolite complexes. Geochemistry, Geophysics, Geosystems, DOI: 10.1002/2016GC006321. (38) - Camilli R., Nomikou P., Escartin E., Ridao P., Mallios A., Killias S. P., Argyraki A., and the Caldeira Science Team: Andreani M., Ballu, V., Campos R., Deplus C., Gbsi T., Garcia R., Gracias N., Hurtos N., Magi L., Mével C., Moreira M., Palomeras N., Pot O., Ribas D., Ruzie L.? Sakellarious D., 2015. The Kalllisti Limnes, carbon-accumulating subsea pools. Scientific Reports, 5, 12152. (37) - Bultel B., Quantin C., Andreani M., Clenet H., Lozac'h L., 2015. Deep alteration between Hellas and Isidis basins. Icarus, 260, 141-160. (36) - Roumejon S., Cannat M., Agrinier P., Godard M., Andreani M. 2015. Serpentinization and fluid pathways in tectonically exhumed peridotites from the Southwest Indian Ridge (62°-65°E). Journal of Petrology, 1-32, doi: 10.1093/petrology/egv014. (35) - Debret B., Bolfan-Casanova N.,Padron-Navarta J. A., Martin-Hernandez F., Andreani M., Garrido C., Sanchez-Vizcaino V. L., Gomez-Pugnaire M. T., Munoz M., Trcera N., 2015. Redox state of iron during high-pressure serpentinite dehydration. Contributions to Mineralogy and Petrology. 169:36. (34) - Peuble S., Godard M., Luquot L., Andreani M., Martinez I., Gouze P., 2015. CO2 geological storage in olivine rich basaltic aquifers: new insights from reactive-percolation experiments. Applied Geochemistry , 52, 174-190. (33) - Peuble S., Andreani M., Godard M., Gouze P., Barou F., Van de Moortele B., Mainprice D., Reynard B., 2015. Carbonate mineralization in percolated olivine aggregates: linking effects of crystallographic orientation and fluid flux. American Mineralogist, 100, 2-3. (32) - Andreani M., Escartin J., Delacour A., Ildefonse B., Godard M., Dyment J., Fallick A.E., Fouquet Y., 2014. Tectonic structure, lithology and hydrothermal signature of the Rainbow massif (Mid-Atlantic Ridge 36°14'N). Geochemistry, Geophysics, Geosystems, DOI: 10.1002/2014GC005269. (31) - Debret B., Andreani M., Muñoz M., Bolfan-Casanova N.,Carlut J., Nicollet C., Schwartz S., Trcera N., 2014. Evolution of Fe redox state in serpentine during subduction. Earth and Planetary Science Letters, 400, 1-13. (30) - Debret B., Koga K., Nicollet C.,Andreani M., Schwartz S., 2013. F, Cl, and S input via serpentinite in subduction zones: implications on the nature of fluid released at depth. Terra Nova, doi:10.1111/ter.12074. (29) - Kaszuba J., Yardley B., Andreani M., 2013. Experimental perspectives of mineral dissolution and precipitation due to CO2-water-rock interactions. In "Geochemistry of geologic CO2 sequestration", edited by D. DePaolo, D. Cole, I. Bourg and A. Navrotsky. Reviews in Mineralogy and Geochemistry, Mineralogical society of America., 77, 153-188, doi10.2138/rmg.2012.77.0. (28) - Andreani M., Daniel I., Pollet-Villard M., 2013. Aluminium speeds up the hydrothermal alteration of olivine. American Mineralogist, 98, 1738-1744. (27) - Debret B., Andreani M., Godard M., Nicollet C., Schwartz S., 2013. Trace element behaviour during serpentinisation / deserpentinisation of an eclogitized oceanic lithosphere: a LA-ICPMS study of the Lanzo ultramafic massif (Western Alps). Chemical Geology, 357, 117-133. (26) - Picazo S., Manatschal G., Cannat M., Andreani M., 2013. Deformation associated to exhumation of serpentinized mantle rocks in a fossil Ocean Continent Transition: the Totalp unit in SE Switzerland. Lithos,doi.org/10.1016/j.lithos.2013.05.010. (25) - Godard M., Luquot L., Andreani M., Gouze P., Gibert B., 2013. Incipient hydration of mantle lithosphere at ridges: a reactive percolation experiments. Earth and Planetary Science Letters, 371-372, 90-102. (24) - Sauter D., Cannat M., Roumejon S., Andreani M., Birot D., Bronner A., Brunelli D., Carlut J., Delacour A., Guyader V., MacLeod C., Manatschal G., Mendel V., Menez B., Pasini V., Ruellan E., Searle R., 2013. 11 million years-continuous exhumation of mantle-derived rocks at the Southwest Indian Ridge, Nature Geosciences, doi:10.1038/ngeo1771. (23) - Andreani M., Muñoz, M. Marcaillou C., Delacour A.,. 2013. µXANES study of iron redox state in serpentine during oceanic serpentinization. Lithos, 178, 70-83, doi.org/10.1016/j.lithos.2013.04.008. (22) - Debret B., Nicollet C., Andreani M., Schwartz S., Godard M., 2012. Three steps of serpentinization in an eclogitized oceanic serpentinization front (Western Alps). Journal of Metamorphic Geology, doi:10.1111/jmg.12008. (21) - Boutareaud S., Hirose T., Andreani M., Pec M., Calugaru D-G., Boullier A-M., Doan ML., 2012. On the role of phyllosilicates on fault lubrication: insight from micro- and nano-structural investigations on talc friction experiments. Journal of Geophysical Research, doi:10.1029/2011JB009006. (20) - Deschamps F., Godard M., Guillot S., Chauvel C., Andreani M., Hattori K., Wunder B., France L., 2012. Behaviour of fluid-mobile elements in serpentinites from abyssal to subduction environments: Example from Cuba and Dominican Republic. Chemical Geology, doi: 10.1016/j.chemgeo.2012.04.009. (19) - Luquot L., Andreani M., Gouze P., Camps P., 2012. CO2 percolation experiment through chlorite/zeolite-rich sandstone (Pretty Hill formation - Otway Basin - Australia). Chemical Geology, 294-295, 75-88. (18) - Blackman D.K., Ildefonse B., John B.E., Ohara Y. , Miller D.J. , and IODP 304-305 Science Party, 2011. Drilling Constraints on Lithospheric Accretion and Evolution at Atlantis Massif, Mid-Atlantic Ridge 30°N. Journal of Geophysical Research, DOI:10.1029/2010JB007931. (17) - Deschamps F., Guillot S., Godard M., Andreani M., Hattori K., 2011. Serpentinites act as sponges for fluid-mobile elements in abyssal and subduction zone environments. Terra Nova, 23, 1, 1-8. (16) - Luquot, L., Andreani M., Godard, M., Gouze, P., and Gibert, B., 2010. Serpentinization of sintered olivine during seawater percolation experiments. In : Water-Rock Interaction XIII. Ed. by P. Birkle and I. S. Torres-Alvarado. London : Taylor & Francis. (15) - Pèpe G., Dweik J., Jouanna P., Gouze P., Andreani M., Luquot L., 2010. Atomic modelling of crystal/complex fluid/crystal contacts- Part II. Simulating AFM tests via the GenMol code for investigating the impact of CO2 storage on kaolinite/brine/kaolinite adhesion. Journal of Crystal Growth, v312, 22, 3308-3315. - Gaill, F., Ballu, V., Cannat, M., Crawford, W., Dyment, J., Escartín, J., Fouquet, Y., Goslin, J., Reverdin, G., Sarradin, P.-M., Tarits, P., Andréani, M., Bonnivard, E., Bucas, K., Burgaud, G., Cambon, M.A., Cueff, V., Durand, C., Gros, O., Hamel, G., Henriques, M., Hoisé, E., Ildefonse, B., Konn, C., Le Bris, N., Le Guyader, H., Ravaux, J., Shillito, B., Toullec, J.Y., Zbinden, M., 2007. Cruise MoMARDREAM-Naut and other MoMAR experiments at Rainbow and lucky Strike in summer 2007. InterRidge News, 16 : 15-16. - Blackman, D.K., Ildefonse, B., John, B.E., Ohara, Y., Miller, D.J., MacLeod, C.J., and the Expedition 304/305 Scientists, Proceedings of the Integrated Ocean Drilling Program, 304/305 Expedition reports; College Station TX - Integrated Ocean Drilling Program Management International, Inc.
Peuble S., Andreani M., Godard M., Van de Moortèle B., Gouze P., Reynard B., CO2 mineralization in percolated olivine-rich rocks: control of olivine crystallographic orientation and fluid flux. Goldschmidt conference, Florence, Italy, Aug. 2013. (60) Andreani M., Godard M., Delacour A., Escartin J., Mével C., Muñoz M., Mass transfers during serpentinization of oceanic peridotites. Invited talk, AGU fall meeting, San Francisco,USA, dec 2011. (60) Delacour A., Busigny V., Cannat M., Andreani M., Mével C., Serpentinization and hydrothermal activity: new insights from Fe isotopes. AGU fall meeting, San Francisco,USA, dec 2011. (59) Sauter D., Cannat M., Andreani M.,, Birot D., Bronner A., Brunelli D., Carlut J., Delacour A., Guyader V., Mendel V., Menez B., MacLeod C., Pasini V., Roumejon S., Ruellan E., Searle R., Mantle exhumation at the southwest Indian ridge: preliminary results of the Smoothseafloor cruise, AGU fall meeting, San Francisco,USA, dec 2011. (58) M. Andreani, M. Muñoz, Marcaillou C., Delacour A.,. Iron speciation in serpentines during oceanic-type serpentinization. Goldschmidt conference, Prague, Czech Republic, Aug. 2011. (57) M. Andreani, M. Pollet-Villard, L. Luquot, B. Menez, S. Peuble, A-L. Auzende, M. Godard, P. Gouze. Natural v.s. experimental peridotites carbonation. IODP/ICDP Workshop on "The geological carbon capture & storage in mafic and ultramafic rocks", Muscat, Sultanate of Oman, Jan. 2011. (56) P. Gouze, L. Luquot, M. Andreani, M. Godard, Peuble S., In situ carbon dioxide sequestration via mineral carbonation: new insights from lab-scale flow-through experiments. AGU fall meeting, San Francisco,USA, Dec. 2010. (55) Andreani M., Gouze P., Luquot L., Pèpe G., Dweik J., Jouanna P., Changes in seal capacity of fractured claystone caprocks induced by dissolved and gaseous CO2 seepage: evidences from experiments and molecular modelling.AGU fall meeting, San Francisco,USA, Dec. 2010. (54) ML Doan, T. Hirose, S. Boutareaud, M. Andreani, AM Boullier, D. Calugaru. Effect of talc fraction on frictionnal strength of serpentine gouge at coseismic slip velocity. Workshop on "physico-chemical processes in seismic faults", Padova, Italy, Nov. 2010. (53) S. Boutareaud, T. Hirose, ML Doan, M. Andreani, D. Calugaru, M. Pec, AM Boullier, B. Cordonnier. Talc fault lubrication at seismic velocities. Workshop on "physico-chemical processes in seismic faults", Padova, Italy, Nov. 2010. (52) B. Debret, Nicollet C., Andreani M., Schwartz S., Godard M., Etude pétrologique d'un paléo-front de serpentinisation océanique éclogitisé. Réunions de Sciences de la Terre, Oct. 2010. (51) L. Luquot, M. Andreani, M. Godard, P. Gouze, B. Gibert, Serpentinization of sintered dunite during seawater percolation experiments. Proceedings of the 13th International Conference on Water-Rock Interations, Guanajuato, Mexico, August 2010. (50) Gouze P., Andreani M., Luquot L., Pèpe G., Dweik J., Jouanna P., Clay particles decohesion during dissolved and gaseous CO2 injection through fractured claystone: experimental and molecular modelling apporaches. Water-Rock Interations meeting, Guanajuato, Mexico, August 2010. (49) Delacour A., Andreani M., Godard M., Cannat M., Picazo S., Mével C., Ildefonse B., Fouquet Y., Dyment J., Serpentinization along the Mid-Atlantic Ridge (13°-36°N). AGU Chapman Conference, Chypre, May 2010. 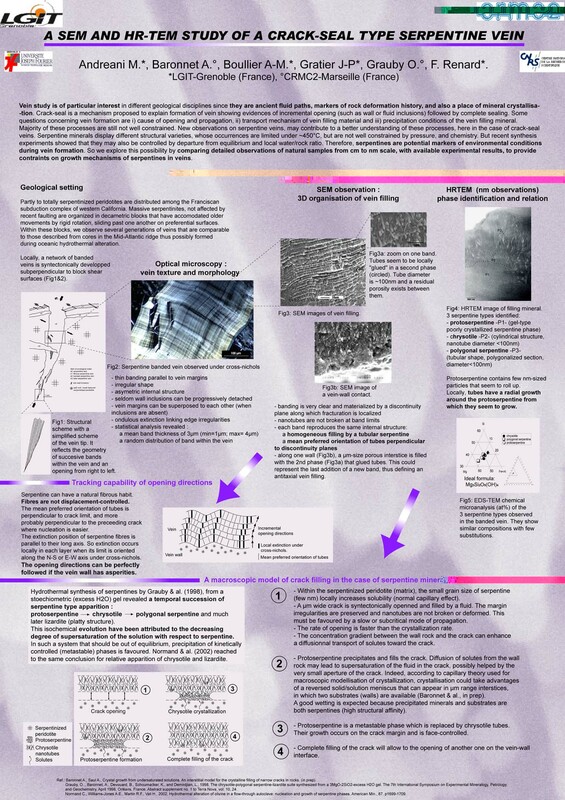 (48) Escartin J., Andreani M., Hirth G., Strain localization along detachment faults and the mechanical role of serpentine, talc, tremolite and chlorite. AGU Chapman Conference, Chypre, May 2010. (47) Andreani M., Ildefonse B., Delacour A., Escartin J., Godard M., J. Dyment, Tectonic structure and internal composition of the Rainbow massif, Mid-Atlantic Ridge 36°14'N. AGU Chapman Conference, Chypre, May 2010. (46) S. Boutareaud, T. Hirose, ML Doan, M. Andreani, D. Calugaru, AM Boullier. Talc-bearing fault at co-seismic velocities: an attempt to explain the San Andreas Fault behaviour. AGU fall meeting, San Francisco,USA, Dec. 2009. (45) M. Andreani, M. Godard, C. Mével,. LA-(HR)-ICPMS study of serpentinites from ODP site 920, (23°N MAR): insights on transfers and trace element distribution during serpentinization. EGU, Vienna, Austria, April 2009. (44) M. Godard, M. Andreani, O. Alard, Y. Gréau. LA-(HR)-ICPMS study of peridotites from the MARK and Fifteen-Twenty Fracture Zone areas (ODP Sites 920 and 1274, Mid-Atlantic Ridge): New insights on the relative enrichments in highly incompatible elements in abyssal peridotites. EGU, Vienna, Austria, April 2009. (43) S. Boutareaud, T. Hirose, ML Doan, M. Andreani, D. Calugaru. Frictional behaviour of talc at seismic slip rates: preliminary results from high-velocity experiments. EGU, Vienna, Austria, April 2009. (42) F. Deschamps , S. Guillot , M. Godard , Chauvel C., M. Andreani. Behaviour of fluid mobile elements during subduction and exhumation of abyssal peridotites: Examples of serpentinites from Cuba and Dominican Republic, EGU, Vienna, Austria, April 2009. (41) A.Tsutsumi,, O. Fabbri, K. Ujiie, M. Andreani. Frictional Properties of Sediments from Nankai Trough IODP Expedition 316: Results from an Intermediate-Velocity Test. AGU, San Francisco,USA, Decembre 2008. (40) P. Gouze, Lods, G., M. Godard, M. Andreani. Modeling lithosphere hydration processes at slow spreading ridges: What are the parameters controlling the formation of low temperature ultramafic hydrothermal vents? AGU, San Francisco,USA, Decembre 2008. (39) F. Deschamps, S. Guillot, M. Godard, M. Andreani. Mantle Wedge Serpentinization : New Constraints on Fluid Mobile Elements (As, Sb, B, Li) Behaviour During Subduction Processes. AGU, San Francisco,USA, Decembre 2008. (38) M. Andreani, M. Godard, C. Mével,. Seawater-mantle interaction at slow spreading ridges : an in-situ trace element study of serpentinites from the MARK area (ODP site 920, 23°N) Goldschmidt, Canada, July 2008. (37) F. Deschamps, S. Guillot, M. Godard, M. Andreani . In-situ characterization of subduction-related serpentinites: a new vision on behaviour of fluid mobile elements during subduction factory. EGU, Vienne, Autriche, Avril 2008. (36) L. Luquot, M. Andreani, P. Gouze, Etude expérimentale de l’évolution des propriétés hydrodynamiques d’un réservoir carbonaté et de sa couverture argileuse lors de l’injection de CO2.Séminaire ANR « Captage et stockage du CO2 », Pau, Decembre 2007. (35) M. Andreani, L. Luquot, P. Gouze, M. Godard, B. Gibert, Experimental carbonation of peridotite during aqueous-CO2 injection. AGU, San Francisco,USA, Decembre 2007. (33) J. Escartin, M. Andreani, G. Hirth, B. Evans, Relationship between the microstructural evolution and rheology of talc at elevated pressure and temperature. Journées « serpentines » de la SFMC, Grenoble, Octobre 2007. (32) Ildefonse B., M. Andreani, E. Hoisé, Echantillonnage geologique autour du site hydrothermal Rainbow, (campagne MoMARDREAM juill. 2007). Journées « serpentines » de la SFMC, Grenoble, Octobre 2007. (31) A-M. Boullier, M. Andreani, SAFOD: des serpentines dans la faille de San Andreas. Journées « serpentines » de la SFMC, Grenoble, Octobre 2007. (30) A. Baronnet, B. Devouard, M. Andreani, O. Grauby, A TEM-assisted crystallographic study of serpentine onion microstructures and their relationship with polygonal serpentine. Journées « serpentines » de la SFMC, Grenoble, Octobre 2007. (29) M. Andreani, L. Luquot, P. Gouze, M. Godard, B. Gibert. Experimental alteration of peridotite by reactive percolation: first results with CO2-enriched fluids. Journées« serpentines », Grenoble, Octobre 2007. (28) T. Nozaka, P. Fryer, M. Andreani, S. K. Sharma and P. V. Zinin. Clay minerals after olivine: Characterization with optical microscope, Raman spectrometer and electron microscope. IODP Exp. 304/305 post-cruise meeting. Hawaï, Septembre 2007. (27) C. Lefebvre, A. Chauvet, M. Andreani, F. Meresse, Y. Lagabrielle, E. Masini. 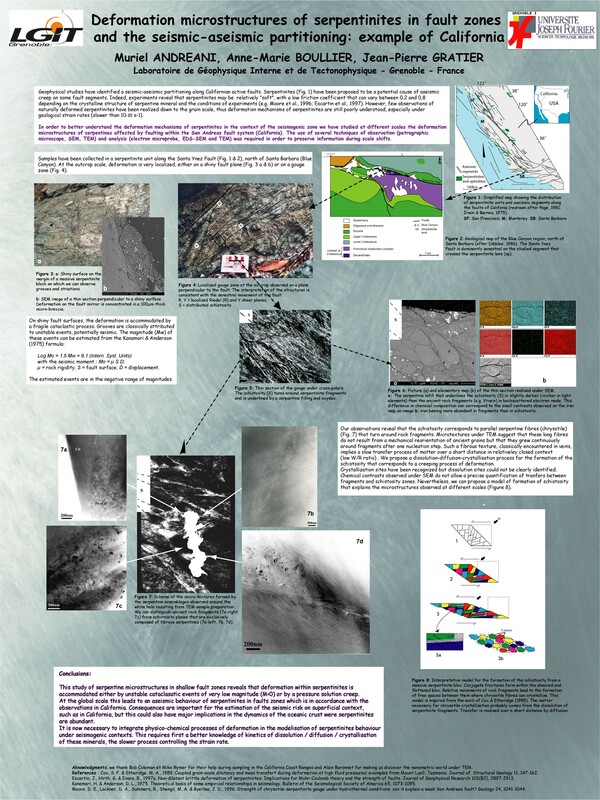 Relicts of oceanic detachment-related structures within the Corsican ophiolites: witnesses of possible Tethyan OCT. International meeting on ocean Continent Transition, Paris, Septembre 2007. (26) F. Deschamps, S. Guillot, M. Godard, M. Andreani, K. Hattori, B-M. Saumur. Subduction-related serpentinites : new insights from microprobe and laser ICP-MS analyses on serpentine minerals. Subduction zone geogynamics conference, Montpellier, Juin 2007. (23)- L. Luquot, P. Gouze, Y. Melean, M. Andreani. Experimental percolation of CO2 saturated brine in carbonate rocks at 100°C-12MPa. AGU, SanFrancisco, USA, Decembre 2006. (22)- S. Guillot, K. Hattori, M. Andreani, M. Godard. L'arsenic, marqueur de l'hydrothermalisme dans les zones de subduction. RST, Dijon Decembre 2006. (21)- A. Baronnet, O. Grauby, M. Andreani, B. Devouard, N. Krasnova. A TEM/AEM survey of serpentine microstructures. IMA, Kobe, Japan, July 2006. (20)- T. Nozaka, M. Abratis, M. Andreani, J.S. Beard, A. Delacour, M. Drouin, B.R. Frost, P. Fryer, A. McCaig, Y. Ohara and the Shipboard Scientific Parties of IODP Expedition 304/305. A preliminary result of an oceanic lithosphere drilling: IODP Expedition 304 and 305 at the Atlantis Massif, the Mid-Atlantic Ridge 30°N. IMA, Kobe, Japan, July 2006. (19)- A. Baronnet, O. Grauby, M. Andreani, B. Devouard, N. Krasnova. Curved microstructures of serpentine revisited by TEM imaging and electron diffraction. Clay and Clay Minerals, Poshchino, Russie, June 2006. (18)- A. Baronnet, O. Grauby , M. Andreani , B. Devouard, 2006. Microstructures and microchemistry of serpentines. Macla, 4. (17)- A. Baronnet, M. Andreani, O. Grauby. Polyhedral onions as a novel microstructure of serpentine. "Environmental Mineralogy and Toxic Metals", Joint Meeting of the Clay Minerals Society and the French Clay Group, Oléron, June 2006. (15)- A. McCaig, B.R. Frost, J.S. Beard, M.W., Abratis, M. Andreani, A. Delacour, M. Drouin, P. Fryer, T. Nozaka, Y. Ohara and the Shipboard Scientific Parties of IODP Expedition 304/305. Alteration and fluid flow in a 1400m section of oceanic gabbros at 30°N, IODP site U1309D, Mid-Atlantic Ridge. AGU, Decembre 2005. (14)- B. R. Frost, , M.W. Abratis, M. Andreani, A. Delacour, M. Drouin, P. Fryer, A. McCaig, T. Nozaka, Y. Ohara and the Shipboard Scientific Parties of IODP Expedition 304/305. Importance of silica activity to the serpentinization processes: Insights from microrodingites in IODP hole 1309D. AGU, Decembre 2005. (12)- A. McCaig, M. Abratis, M. Andreani, M. Drouin, R. Frost, G. Hirth and the Shipboard Science Party, IODP Expedition 304/305. Reaction-induced microcracking and fluid flow into the oceanic crust beneath an extensional detachment fault at 30°N, IODP site 1309. Geophysical Research Abstract, Vol. 7, EGU, april 2005, Vienna, Austria. (11)- A. Baronnet, O. Grauby, B. Devouard, M. Andreani, A-L. Auzende, F. Boudier. Les minéraux serpentineux et leurs micro structures revisitées: correspondances entre microscopies photonique électronique en transmission. Reunion des Sciences de la Terre, Septembre 2004, Strasbourg, France. (10)- M. Andreani, A-M. Boullier, A. Baronnet, J-P. Gratier. Les microstructures de déformation des serpentines et la partition sismique-asismique : exemple de la Californie. Invited seminar, Laboratoire de Géoscience Marines, IPG, May 2004, Paris, France. (9)- A. Baronnet, O. Grauby, M. Andreani, B. Devouard. Disequilibrium aspects of serpentine microstructures as related to early, pseudomorphic serpentinisation : a TEM/AEM outlook. Geophysical Research Abstract, Vol. 6, EGU, april 2004, Nice, France. (7)- M. Andreani, A. Baronnet, A-M. Boullier, J-P. Gratier, O. Grauby. Micro-structures, micro-textures et croissance des serpentines dans les veines : exemple d’une veine de type « crack-seal ». Réunion « Serpentines » de la SFMC/SGF, november 2003, Paris, France. (6) - A. Baronnet, M. Andreani, J-P. Astier, A-L Auzende, E. Belluso, B. Devouard, O. Grauby, N. Krasnova. Microstructures et micro-textures des serpentines. Réunion « Serpentines » de la SFMC/SGF, november 2003, Paris, France. (5) - M. Andreani, A-M. Boullier, J-P. Gratier. Déformation des serpentines par dissolution-cristallisation dans la gouge de la faille active de Santa Ynez, Californie. Réunion « Serpentines » de la SFMC/SGF, november 2003, Paris, France. multi-scale approach. Invited seminar, EAWAG, research unit of the ETH, July 2003, Switzerland. (2)- F. Renard, M. Andreani, A-M. Boullier, P. Labaume. Statistical analysis of crack-seal patterns. EGS-AGU-EUG , april 2003, Nice, France. (1)- M. Andreani, A. Baronnet, A-M. Boullier, J-P. Gratier. Textures and microstructures of serpentines in veins. Ecole thématique du CNRS et de la SFMC (French Society of Mineralogy and Cristallography), june 2002, Luminy-Marseille.